Situated in the centre of the UNESCO–declared World Heritage area, the Sung Sot or Surprise Grotto is on Bo Hon Island, and is one of the finest and widest grottoes of Ha Long Bay. Ascending to the grotto, the way is covered by trees and foliage, and consists of great paved stone blocks. Sung Sot Cave is on the same island with Trinh Nu cave. The path to Sung Sot is quite steep and is lined with shady trees. The cave has 2 chambers. The outer chamber is square and is often referred to as the waiting room. The cave’s ceiling is approximately 30 m high. The walls are almost perfectly smooth as if it was built by man. The walls generate a variety of colors that blend with the setting of the area. 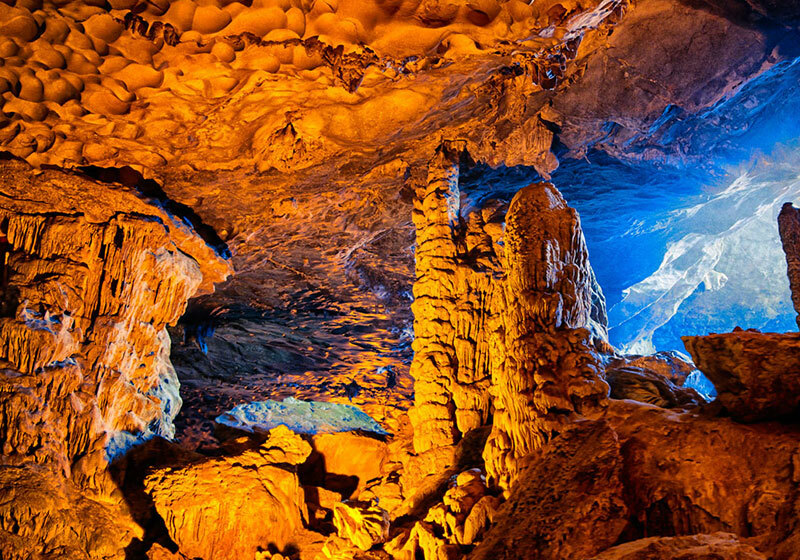 Short Description: Sung Sot Cave is one of the largest and most beautiful caves in Halong Bay. Located in Bo Hon Island, Sung Sot Cave is a place where many rocky islands concentrated having distinct and strange shapes, which cannot find in other ones.